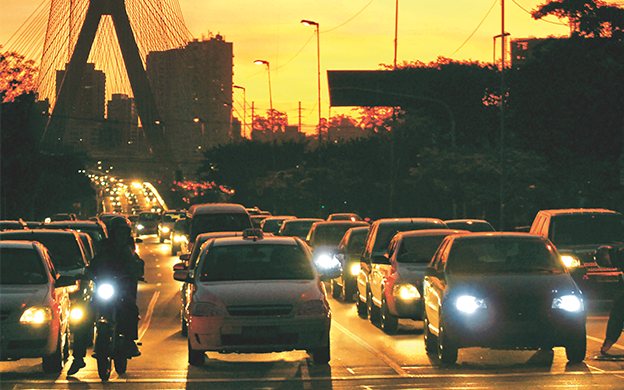 Here an ad, there an ad, you stumble over it on the internet, and your colleagues casually mention it over lunch: “Just had my lights tested, finally I’ll no longer dazzle other drivers …” or something along those lines. A lights inspection, oh yeah. The thing that always starts in October shortly before it gets really dark outside. The thing that I personally forget about again and again and again. It’s not a thing really, it’s a free check to improve safety. This year, I’ve finally thought of it early enough, if for no other reason than writing a short article about it. Because I don’t just have a straightforward car that fits into one of those fixed price service packages. My Taunus coupé is at the tender age of 46 and has Bilux headlights that were upgraded to H4 in the 80s. Let’s see what the boys and girls at Ford will say when I bring it round. “No, you don’t need an appointment, just come over. 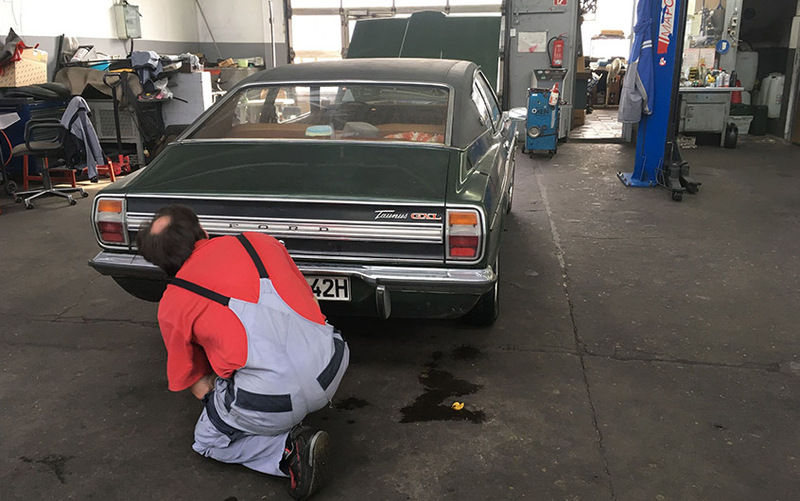 We always carry out lights inspections straightaway,” the friendly lady on the phone at Ford Krüll in North Hamburg said to me so I’ll go there now. I explain my request, point out the age of the vehicle and get a cup of coffee. There are a number of half-empty cups on the table in front of me; the wait doesn’t seem to be too long. Not for me either. Shame, the coffee was actually quite tasty. A mechanic drives the old banger into the garage. He gets out and other mechanics come over immediately, all eyes lit up. Nobody’s seen that kind of vehicle for at least 15 years. 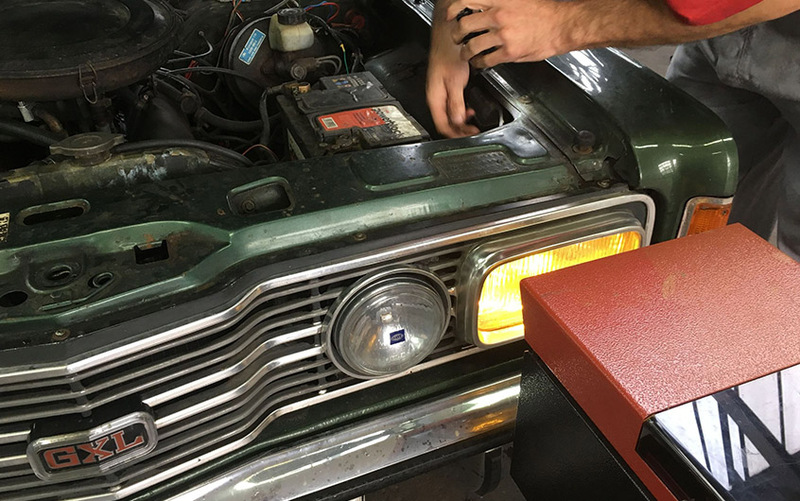 The assigned mechanic’s eyes light up too (“Damn, that thing’s older than me!”). He unlatches the heavy hood and gets to work whistling happily. 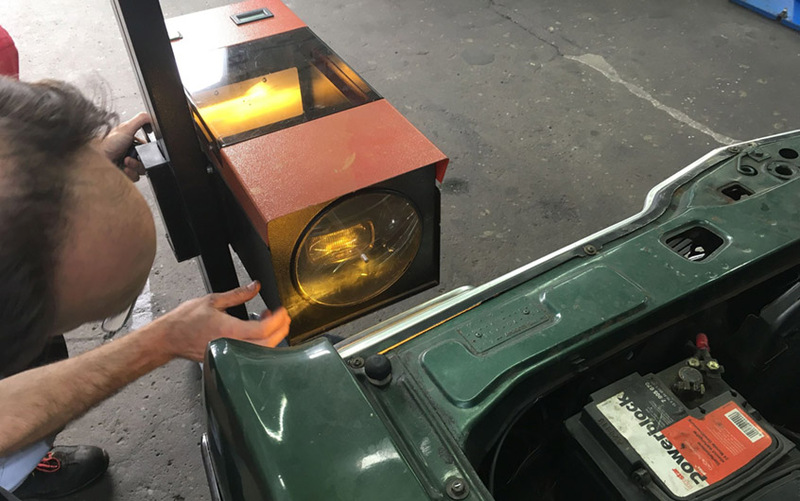 He uses the small red cart to measure the image that headlights and high-beam headlights throw onto the prescribed diagram. 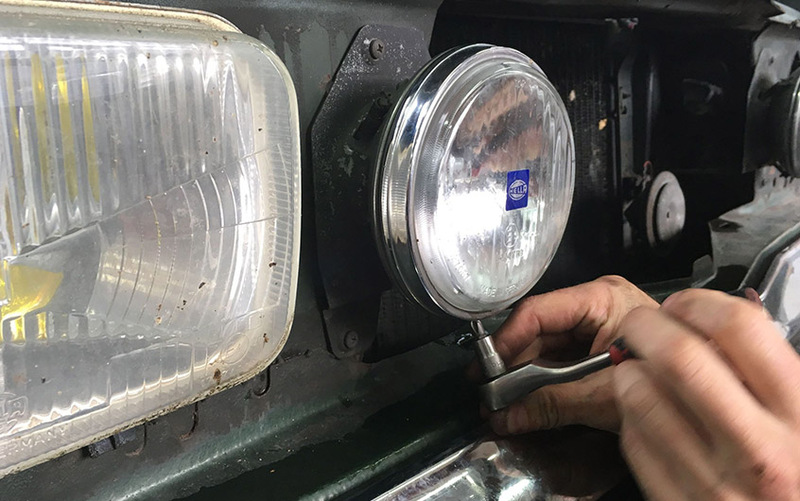 Dipped beam needs a few small adjustments which can be made easily enough by turning the big screws behind the headlights. 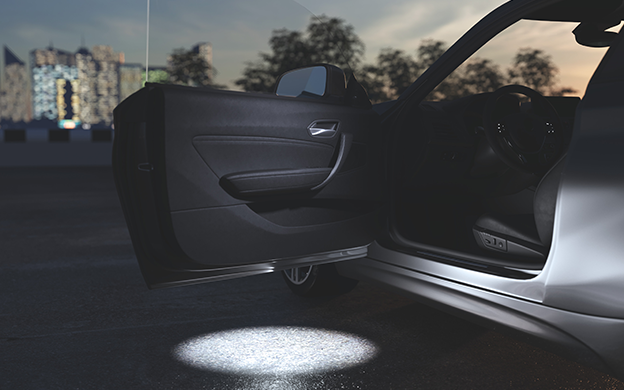 High beam, however, which is in my grille as additional lights, shines at the trees. O…K. The radiator grille needs to come out for that; I’ll do that myself. It takes me exactly 42 seconds including taking out all the screws. 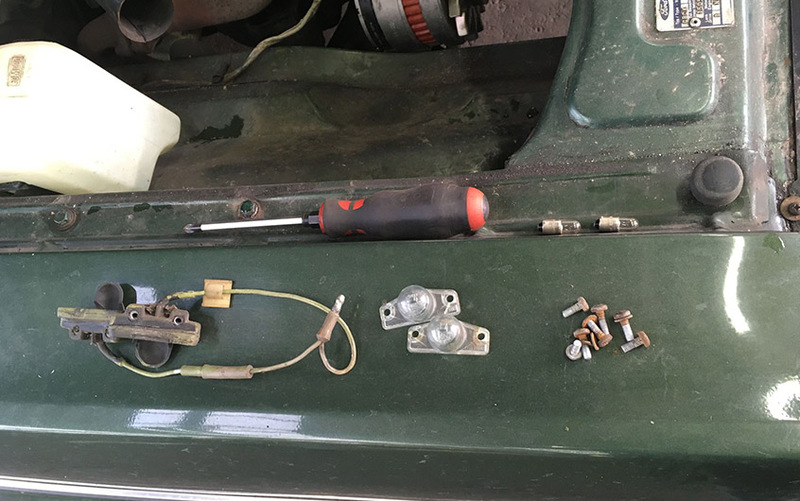 The friendly man turns the high-beam headlights back toward the ground and also finds a fixing screw that isn’t sitting properly in its thread. He recuts the thread and inserts a new screw. “Just so you won’t lose the glass …” Very considerate. 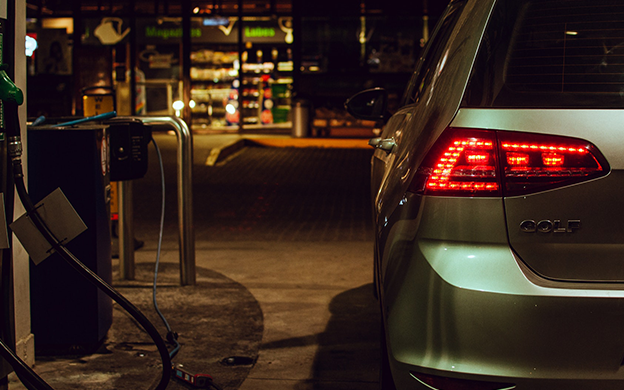 The indicators are flashing, the rear and brake lights are a subtle red, and the reversing lights are white. Only the number plate lights are dark on both sides. I ask him whether he could turn a blind eye. After all it’s only the number plate lights, right? No, he can’t, but he orders two new lamps from stock and starts purposefully unscrewing the lampholders from the bumper. A little patina, a little corrosion and two burnt out lamps. Okay. He cleans the contacts, grinds down the screws (because they’re protruding over the bumper), puts in the two new Osram lamps (ha!) and screws everything back together. Now everything is lit up that’s supposed to be lit up. And I got the sticker for the windscreen. It cost me 3.29 euros for the two lamps. Now I’m wondering why I don’t do that every year. And I wonder whether they’re always so nice and accommodating at Krüll. In any case, that’s how you gain happy customers. 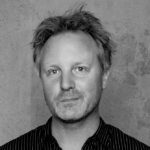 Have you already had your lights tested in 2017? If you haven’t, hurry up. It’s free in October.